Maddison was diagnosed with SMARD in 2009 at 9 months old. It was the worst time of our lifes. The doctors told us to prepare for the worst and to consider letting her go as she will have no quality of life. They said that Maddison would never eat, talk, sit or breath on her own. At ten months old Maddison was put on a ventilator as she could no longer breath unaided. 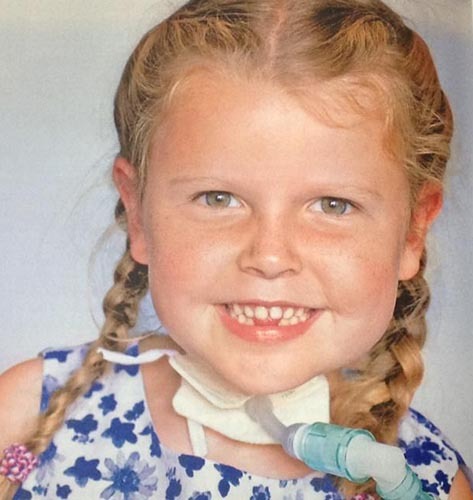 She had to have a tracheostomy to ventilate her 24/7. Maddison was also given a feeding tube direct to her stomach as she wasn't eating well. SMARD is a rare neuromuscular condition that causes muscle wasting. This means Maddison has low muscle tone. SMARD is a life limiting condition as the muscles we use to cough are weak and a common cold can be fatal as she wouldn't be able to clear the secretions out of her lungs. Sadly there is no cure, but thankfully there is a treatment to clear her chest. After 11 long months of being in hospital we brought Maddison home to be with me, her dad and 3 siblings. We had no idea what to expect as the doctors were so negative about Maddisons prognosis. Five years on Maddison is a typical 6 year old girl. Although all the risks are the same with her chest she enjoys life to the full. Her muscles are still weak and she cant walk but she can sit, shuffle, talk, eat and manage 3 hours off her vent. She attends mainstream school and is doing amazing. Life is not easy for Maddison as she needs carers 24/7 and lots of physio etc, but her determination and courage has blown everyone away. This year Maddison won an Inspirational Child Award off Prince Harry, but in my eyes he was the lucky one to meet my Maddison. Please continue to follow Maddisons story and enjoy her fantastic sprit. You can follow Maddisons' progress on her facebook page.